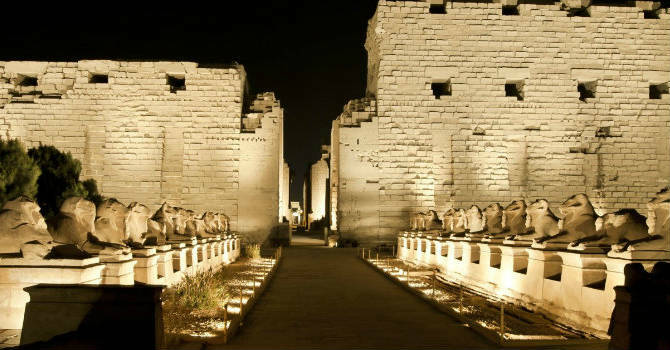 Imagine how pretty is seeing the amazing luminous temples of Karnak against the night darkness ! Unique evening of entertainment in Egyptian style! We will pick you up from the hotel enough time before the show starts, arrive there and walk along the Sphinx Avenue crossing the airy facade deep into the Great Court. Enjoy this booming Pharaoh's voice retraces the history of Egypt and New Kingdom as series of additions were added by different rulers such as King Tutankhamun, Ramses II and Queen Hatshepsut. You will be sitting at the sacred lake while the complex is illuminated and the narration of Egypt continues. Kindly note, while this show is fine for all ages but the the complex is dark and commentary is loud which makes possible that younger children may find it frightening. The ground in Karnak is uneven so we recommend to wear comfortable flat walking shoes.